Estate sales (also known as “tag sales”) are a way to liquidate the belongings of someone who passed away. Estate sales often include just about everything the late person owned, so you never know what you might find for sale. When you attend an estate sale, you’ll usually peruse these items freely as if you were in a store. Most estate sales happen in the summer and fall. They’re a great opportunity for anyone willing to hunt for a great deal. Like all things shopping, however, they take a little getting used to. If you really want to make the most of an estate sale, it pays to plan ahead. Here’s how to do that. Keep these estate sale tips in mind while you’re out there, and you’ll end up an estate sale expert. Estate sales sometimes feel like a free-for-all, but you’ll have better luck if you don’t treat them like one. Instead, be patient and mind your manners, the same way you would at any other kind of sale. If there’s a line to get in or see a particular item, don’t cut or barge your way through. Don’t rush through the door when it opens, and don’t block other attendees while they’re trying to get in. Remember to treat the items you’re looking at with proper respect. Don’t remove stickers or hoard the things you want. Never take something out of someone’s cart, pile, or arms. That last one might sound obvious, but we’ve seen it happen before! If you want the best selection of items, it's best to go on the first day. If you find something you really love that’s outside of your price range, make note of it. You could always go back on the last day to try to get it at a lower price. Remember: estate sales are usually relatively informal, privately-run events. In fact, most estate sales happen inside somebody’s home. The people running the sale often keep their personal items in the same areas where the sale takes place. In cases like these, the people running the sale often ask attendees not to bring large bags with them. Look at it this way: not bringing a bag with you is another part of estate sale etiquette. Leaving your bag at home will also spare you the potential embarrassment of being turned away at the door. It might feel strange, but the best way to approach an estate sale is to pack light. Leave the big shopping bag at home, no matter how helpful it may be. If you’re buying something large, make sure you have a plan for actually taking it home with you. Remember, estate sales are more informal than department sales or large-scale auctions. It’s likely that they won’t have resources to help you move big items. If you go to a sale looking for furniture or some other large item, bring your own means of transporting it. If the estate sale is professionally managed, they almost never allow for haggling on the first day. There's no harm in trying, but don't expect to get savings until later in the sale. In general, try a lighter hand at haggling than you might at other sales, especially early on. You may be able to push your luck a little later, but only if you held off early. Remember, estate sales aren’t regulated the way business sales would be. The people selling the stuff you’re interested in didn’t necessarily clean or inspect it. You don’t want to buy something only to find out it’s moldy, smelly, or gross when you get it home. Give anything you think you may want to buy a careful once-over. Check it for stains, damage, weird smells, or other problems. You may not want to buy something that will take a lot of work to refurbish. This is great advice regardless of why you’re attending the estate sale. If you’re hoping to purchase something for resale, you’ll have to keep it safe until you can resell it. If you’re shopping for your personal use, you have to make sure you have room for what you buy! As always, you have the option to use a storage unit. Climate-controlled units can reliably maintain the integrity of the vintage items for as long as you store them. That way, you’ll be able to keep your resale items separate from your at-home possessions. Or, if you’re buying for your own personal use, you’ll have some extra space to work with. 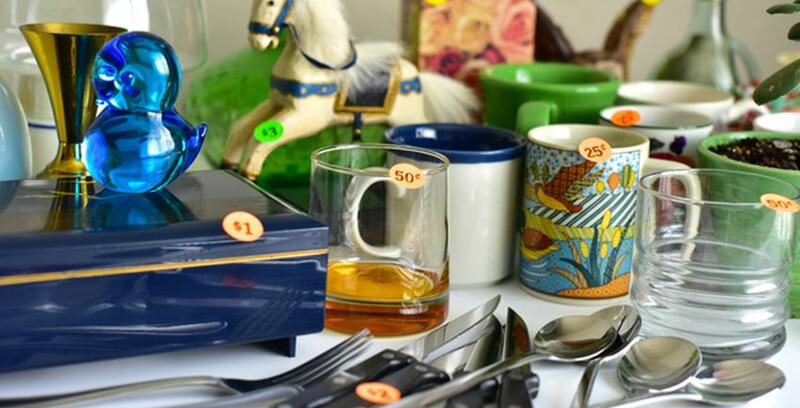 It’s all-too-easy to forget, but you need a place to actually keep the stuff you buy at estate sales. If you need some help with that part of the experience, give Storage Direct a call any time. We have the solution you’re looking for.